#3 finisher (on right) and me (on left) running "side by side" early on. The Pistol Ultra offers distances of 50K solo/relay, 100K and 100M. It is the epitome of an urban ultra. The race takes place on the paved Alcoa-Maryville Greenway near Knoxville airport, a linear path that runs along Pistol Creek. Runners basically run a 5.5 mile out & back section with lollipop loops at each end of the course, totaling approx. 11 miles per loop. That means runners run anywhere from 1 loop (50K relay) to 9 loops (100 miler). The race is perfect for first timers as the RD provides very generous cutoff times for all distances. The entire course is paved with tiny sections of concrete as well as a 10ft dirt section and the elevation gain added up to just 1500ft for the 50K distance and even that seems a bit generous. It is most definitely a fast course, which also makes it a perfect race for those of us looking to get a 50K, 100K or 100M PR. A 100 mile runner might even get away without a headlamp as the majority of the path is well lit 24 hours a day. There were a total of 3 well stocked aid stations including the start/finish area that runners pass by at least 5 times per loop and warming areas and tents were provided for runners as well. 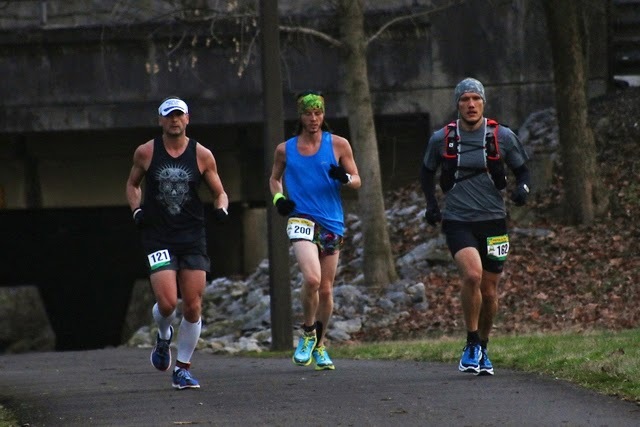 I originally signed up for the Pistol Ultra 100 Miler on the urging of one of my training buddies, Jerry Abbott, who grew up in this area and who still has family there. Both of us had just finished the Pinhoti 100 Miler in early November and as we neared the race date we both realized that neither one of us was mentally prepared to do another 100 Miler just yet. However, both of our wifes had signed up to do their first 50K, so rather than drop out of the 100 Miler, we both decided beforehand to drop to the 50K distance. I knew this course was reasonably flat, so I was eager to try for a new 50K PR. As usual, I had gone online to find the cheapest possible hotel near the race. I've kinda turned it into a game of "how low (hotel price, that is) can you go". This time, I'd really done it. My advice, should you decide to do this race next year (as I plan to), avoid the Executive Lodge at all cost. I'll just leave it at that. My poor selection of accommodations resulted in a rather short night of sleep (along with the place being pretty filthy it was also extremely noisy). 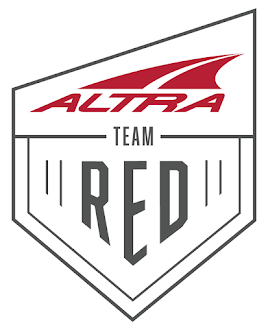 Oh well, I never really sleep that great the night before an ultra, which is why I always make sire to get plenty of sleep the entire week before a race. With the 50K race start scheduled for 7:55AM (100K/100M at 8AM), we were able to "sleep in" until 6AM, enough time to pick up some hot coffee and take care of other needs before heading to the race start. Temperatures were in the low 40s early on, but since I planned on running this race like a marathon, I opted for racing flats, compression socks, shorts, a singlet and some gloves. I figured I'd warm up soon enough. The week before a big race I always go online and research the results from previous years. Not so much to check out other runners performances, more so to see what a reasonable pacing strategy should look like for me. This race was no different, so the weekend before the race I started to play with different paces and pace calculators. Based on previous results and my most recent marathon time (3:03), I decided to shoot for a 3:45 finishing time, which roughly equates to a 7:15 minute per mile pace. When race director Will Jorgensen signaled the race start, a group of 3-4 runners took off sprinting, at least that's what it looked like compared to my pace. I'm still not sure if they were all runners or if there were also a couple of rabbits (pacers) involved, but I knew not to get sucked in to that kind of pace as it was way beyond my abilities. For the first couple of miles, I kept glancing at my GPS watch making sure I settled into my target pace. My goal was to run even splits or at least close to it. I realized that it was highly likely that I would fade some later in the run, but I needed to make sure that "fading" didn't turn into a complete "blow up". A consistent pacing strategy will prevent that and I'd been pretty successful in the past year to set challenging yet attainable goal times for myself at every distance I'd run. Prior to the race, In addition to paying attention to my hydration in the weeks leading up to this race, I chugged a bottle of water with Nuun right before the race along with a Honey Stinger gel and a couple of SCaps. I also set up a mini aid station (aka folding chair) near the start/finish line where I would be able to grab my own hydration and gels, if needed, every time I came through. Somewhere on the first loop, the eventual third place finisher caught up to me and we would lead each other over the next few miles, back and forth. Eventually, he would pass me towards the end of the first loop and I would keep him in sight for most of the race. However, I faded a little more than he did as he finished almost 4 minutes ahead of me. I decided to not worry about fluids or gels for the first loop, similar to how I'd run my marathons. I'm not sure if that really is a great idea, but I think it works for me. I don't usually bonk or maybe I just don't think I bonk and my slow downs late late in the marathons or 50K distances are actually signs of bonking. Anyway, I think I didn't pace myself properly when I slow down towards the end. At both ends of each "loop" were just enough ups and downs to engage different muscles, none of them too long or too severe to really affect one's performance or pacing strategy, but the midsections of the loop were just flat and fast. Any time lost to refueling at aid stations could be made up on those middle sections...until fatigue sets in and you think your making up time when in reality, you continue to slow. That's what happened to me on the final loop. In addition, I must have misinterpreted the runners guide book or the course map or both. Realizing where I was on the course and thinking that I still had a 2 mile loop to do once I reached the start/finish area for the final time really deflated me mentally. Quick ultra-brain math (FYI, quick math and ultra-brain don't go together) had me missing my original finishing goal of 3 hours 45 minutes by about 10 minutes. After all, I still had 2 miles to go once I reached the start/finish area, at least that was my thinking and nobody stopped me from thinking it either. As a result, I kept on keeping on once I crossed the finish line thinking I had to complete another 2 mile lollipop loop before officially finishing the race. Oh well, imagine my surprise when I arrived back at the finish after a 2 mile "cool down" only to be informed that I had completed the race 13 minutes earlier, or more specifically, I had finished the race in 3 hours and 40 minutes and well below my target time. Any day with a serious PR is a good day, so the bonus mileage was just that, bonus mileage. 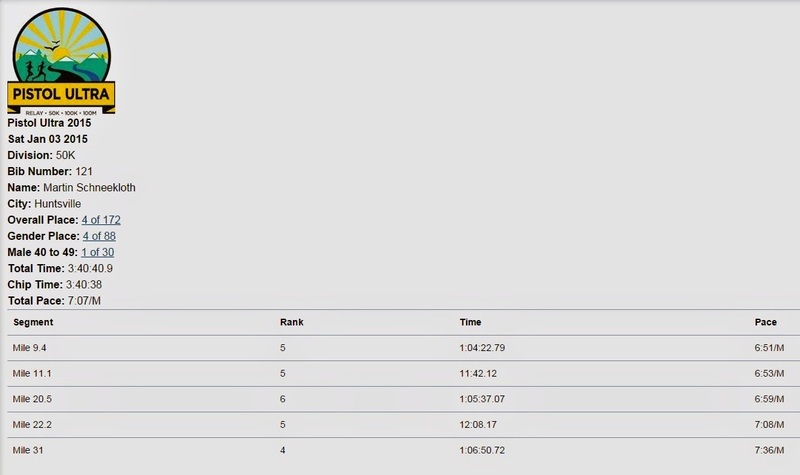 Apparently, one or two runners started the race slightly too fast and as a result, I ended up in fourth place overall. Combine that with my wife finishing her first official 50K race in under 5 hours and it makes for an awesome weekend of running! In case you are wondering whether I think this was a well organized event, I am already considering coming back next year to shoot for a 100K PR:-) Thanks again to Will and his awesome crew of volunteers for putting on an awesome event that provided challenging weather conditions for both runners and volunteers later on in the day and at night. Congrats to all who toed the starting line! I'm the guy in the middle. I was only able to stay with you two for about 3 or four miles before I knew you were in a league of your own and this wasn't just going too fast the first couple of miles. Congrats on the 3:40! That's awesome! Jacob, I had a bit of a blow up on the final loop, kept slowing down.